From The Hart-Parr Oliver Collectors Association: I received the sad news that William Bechthold Sr. passedaway yesterday. He had been affectionately known as 'Mr. Cletrac West'. Our condolences to the Bechthold family. My gramps Howard van Driest was Experimental Engineer at Cletrac and Oliver Corporation. 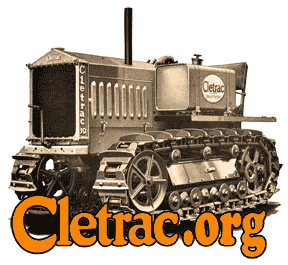 After the plant closed, he and my uncle started an excavating business, initially using Cletrac and Oliver Crawler tractors. Please help Support This Site and give your business exposure by buying a business card sized ad. Like so many of the Oliver/Cletrac group, I never had the privilige to me Mr. Bechthold. Howevere, I have seen a lot of his work featured in the HPOCA magazine.